Milli Muslim League (MML), a new militant party controlled by Islamist Hafiz Saeed, backed a candidate in the September by-election for a seat vacated by ousted Prime Minister Nawaz Sharif in the eastern city of Lahore. Islamabad: The Pakistani army on Thursday confirmed that a plan was in place to try to integrate militant-linked groups into the mainstream of the country's politics. Milli Muslim League (MML), a new militant party controlled by Islamist Hafiz Saeed, backed a candidate in the September by-election for a seat vacated by ousted Prime Minister Nawaz Sharif in the eastern city of Lahore. The United States has offered a $10 million bounty for Saeed's capture. Reuters reported last month that the foray into politics by MML and other Islamists groups followed the integration plan. Three of Sharif's confidants and a retired army general said it had been presented by Inter Services Intelligence to Sharif last year, but the then premier had rejected it. Army spokesman Major-General Asif Ghafoor told a news conference in Islamabad the plan was aimed at developing a constructive role for them. Asked about the MML party loyal to Hafiz Saeed, whom the United States and India accuse of masterminding the 2008 Mumbai attacks that killed 166 people, the army spokesman said it was part of "a process that has started". "It is in my knowledge that the government has started some discussion over it, that, how do we mainstream them, so that they could do constructive contribution," Ghafoor said. A government spokesman did not respond to calls. Pakistan's interior ministry has asked the country's electoral commission not to register Saeed's party, but hasn't taken any other steps to stop it. Another militant party is campaigning for a by-election later in October. It remains unclear whether the army or the ISI went ahead with its plan despite Sharif's rejection, or if the military and the civilian government have recently agreed on the idea. Another Islamist designated a terrorist by the United States, Fazlur Rehman Khalil, told Reuters he too planned to form his own party soon. Within two weeks of Sharif's ouster, the MML party was announced. It later got the backing of Saeed and his lieutenants in the by-election to secure five per cent of the vote. The other hardline party, Tehrik-e-Labaik Pakistan, gained over six per cent of votes by riding on the back of a blasphemy killer Mumtaz Qadri whom it called a hero and a martyr. Saeed has been under house arrest since January in the eastern city of Lahore. MML is the political wing of Saeed's charity Jamaat-ud-Dawa, JuD. 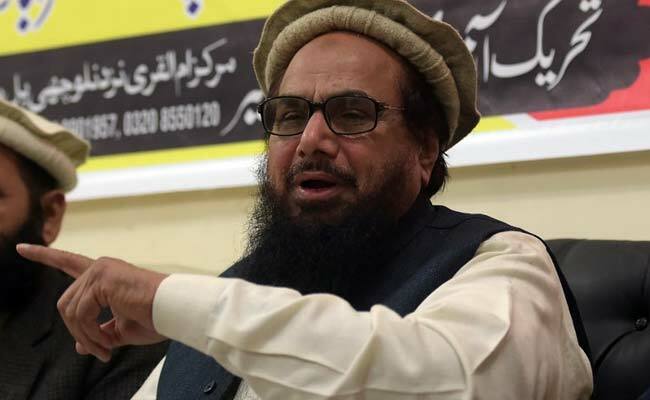 JuD and Khalil's Ansar ul-Umma organisation are both seen by the United States as fronts for militant groups the army has been accused of sponsoring against neighbours, arch-foe India and Afghanistan - a charge the army denies. Reports of the plan to bring militant-linked groups into the political mainstream have stirred debate at home and abroad. "Now, how to take it further - that, the time to come will tell," Ghafoor, the army spokesman' said, "For that, the government will take a decision."